Greetings in the Name of the Lord. Blessings for all of you, my friends; blessed is this hour. In the average human soul there is such a jungle. It is not at all bad or criminal. It is merely confusion, error, lack of self-knowledge, deviation from divine law: it is ignorance that creates a wilderness through which you have to find your way, with God as your final goal. Your inner stubbornness and prejudices create conflicts in your soul, as well as in your outer life. These may be seen as rocks and stones, high mountains which you have to dissolve. You have to make your way through your various faults, which appear in your soul as unruly shrubbery and often as poisonous growth, instead of turning away from them as you did before you decided to go on this path. And there are rivers to cross, wild waters to manage and rechannel. These are your uncontrolled emotions—uncontrolled only because you do not understand their origin and real meaning. There are precipices to jump, my friends—your fears of life as it actually presents itself, your fears of pain and disappointment. To master your life you have to jump into the unknown; to lose your fears you have to go through them. You must not turn away from your self-created precipices, which need not exist in the first place if you were to understand and take life as it is. After you “jump” you find that there was no precipice! The jungle I speak of is not merely an analogy. These forms exist in actual fact. They exist in subtle matter. On the path, you find your way through all the difficulties that exist within yourself. The path is not easy. It is a long mountain climb, very steep at times and often shadowed, enveloped in darkness. At other times, when you have won a small victory the sun comes out and you rest for a while; the scenery becomes a little more friendly and brighter. Then you go on again. Sometimes you cannot see the goal for a long time; you know what it is, but you are far from direct awareness of it. For quite a long while at the beginning of the path, it seems as though you are going around in circles, always encountering the same scenery, apparently not moving from the spot you started from. This would be discouraging if you didn’t know that it is an illusion. Actually, you are moving on, and the circle is what I call “the spiral.” This is an inevitable experience on the path. All your faults, errors, ignorances, and their complexities create one big vicious circle in your soul. This circle consists of individual faults which affect and interact with one another and cause a chain reaction. To break this vicious circle, you have to understand thoroughly the individual faults that constitute your vicious circle. You have to concentrate on one after the other so as to find the link of cause and effect within your circle. The whole circle cannot possibly be understood completely from having made the round only once. When you complete the first round, you start again. Each time you start again, you gain a slightly profounder understanding of the various highlights and individual points in the circle until eventually you see the whole circle in your mind and understand the interdependence of all your negative qualities. Then you will cease to experience your faults as unconnected. Until you reach this perspective, you have to repeat the round often. At the beginning this seems to you like senseless repetition, lacking in progress. It is not! Without going through this most important part on the path you cannot become free and reach the light. Thus the circle becomes a spiral leading upward very gradually. Some of you may think you know your faults already. This will be so only to the extent you have been active on the path. You may know some of your faults, but others you have not yet discovered. As I have said before, there is a vast difference between knowing and knowing. To what depth do you know? How much can you connect your faults with your good qualities? And your faults with each other? Can you really grasp and understand your fears, insecurities, and complexes from the point of view of your faults in relation to their deviation from the divine laws? Until you reach such understanding, you must go around and around in your particular vicious circle. By now you know that all faults come from pride, self-will, and fear. It is essential that you see and feel how each and every one of your faults derives from one or all of these three basic faults. Find the common denominator. This is not easy if you are to understand it emotionally. For that you have to go through the faults and their connections step by step, again and again; you have to follow the vicious circle through until you grasp it well enough so that you can break it at one point. Every time you conclude one round and start the next, you follow an upward-winding spiral. At the beginning the upward slant is so slight that you do not even notice it. But later on, you will clearly feel that every time you start anew, you have gained a profounder insight into your problems, and you will not be discouraged anymore by an apparent standstill. At the very beginning you do not know or feel that there is such a vicious circle in you. You experience such confusion that you do not even know where to begin. Although you know some of your faults and all of your outer problems, you cannot as yet connect the one with the other. That is the most difficult part at the beginning. Everything within yourself is still disorganized. You do not know where to begin, what to hold on to. The moment you focus your attention on one complexity or problem, other things come up that apparently have no connection, and you become confused. Only self-discipline and perseverance will get you to the point when you finally can see the whole picture of the vicious circle, how one defect is caused by another in a chain reaction. When you get to the point of clarity, you are moving into a major phase. You must not get discouraged when at first the disorganization is so great that you do not know where or how to start. After a while everything will no longer be running like sand through your fingers. You will have something definite to hold on to, a clear picture of this cycle. The vicious circle consists of a multiplicity of character defects which, at various points, will draw together and show you major problems that can be looked at and worked with. When you progress further, you will find one major point that is the key to your entire personality and to all your problems. You must find that key yourself, and you must do it through your own labor. To tell it to you would not do you any good. The forms I speak of do exist, my friends. And we, in spirit, can see them clearly. On the path, the forms vary with each individual, for no two people are alike or have the same outer manifestation of inner problems. An infinite variety of good and bad currents influence one another. I promised you that I would speak about prayer tonight, because it is one of the most essential requisites to develop and advance on the path. Without prayer—and putting your intentions into practice—nothing can be accomplished. Now what is prayer? Many people have no questions about it; they just take it for granted. Many others cannot understand prayer. They say—in their own way and not without logic—why should God grant a human being help or grace simply in response to prayer? Why should someone else who works but fails to pray not receive it? This argument seems, at first sight, logical. But the simple fact is that a person who does not pray will never be able to act or experience fulfillment like the person who has learned what proper prayer is and practices it. I will now try to explain this to you. God’s grace, God’s help, and God’s light exist all over the universe. God does not decide to give or to withhold it, my friends. The experience of God’s love depends on how receptive one is. It is up to the individual, in the body or as a spirit, to breach the wall that separates the lower self from God’s grace, God’s strength, God’s mercy, God’s love, and all the other divine attributes. Prayer is essential to achieve this goal. “How?”—you may ask. In the first place, prayer is the best exercise for learning concentration. Without the ability to concentrate you cannot achieve anything in life. You need to be able to concentrate when you are on the path. Many systems exist in your world that advise particular, separate concentration exercises. My advice however is that prayer and concentration exercises can be combined. There is no better way of learning to concentrate than by a systematic way of praying. By focusing on an object you will not learn concentration any better than you will by zeroing in on what you want to pray for. You can simultaneously derive the benefit of prayer without losing time by concentrating on some non-essentials. Anyone on the path must learn to focus attention on what is really essential. Concentration on an object is not essential, but may be better than nothing, so that someone who has no belief in God may at least learn concentration. Daily prayer is important because of the concentration and the discipline that are prerequisites for the process of purification. How can you be on the path if you cannot give yourself a necessary and regular discipline? How can you be on the path if you are unable to concentrate on the mainstream of your life, specifically your spiritual development? You learn to concentrate when you pray, for instance, for your loved ones. First, you engage in the mental process of thinking of them; then to that mental process you bring your feelings and the depths of your soul, your deepest wishes for God’s grace. The same procedure should be practiced in praying for your enemies. Here the mental process may not be so difficult, but uniting your feelings with your good will may be a lengthier task. Pray for individuals you know, as well as for humanity and all spirits in the universe as a whole. Pray for peace, the spreading of truth and the fulfillment of the Plan of Salvation. Pray for all the blind creatures who are still in darkness. Pray for the purification process of more and more individuals. Concentrate on the thought forms of everything you have learned: the necessity for self-unfoldment through self-recognition; the overcoming of the lower self; the rechanneling of wrong currents, and the attainment of love, brotherhood, humility, and the union and development of all beings. Such thoughts create clear, light, and good forms that will definitely have effect. This most creative activity will strengthen your mind, even if it does nothing else. Of course, your thoughts will stray at the beginning. Of course, you will have difficulty maintaining and focusing your attention, but that is the work to be done. If you do not let yourself become discouraged by the inevitable initial hurdles, eventually, little by little, you will learn to pray better. When your thoughts wander, just start where you left off without any self-reproach, being mentally and emotionally as relaxed as possible. Prayer is a training that is part of your development. In addition to the concentration and discipline prayer helps you achieve, you benefit in that during prayer your frame of mind will automatically be different from when you do not pray. This will occur in more ways than one. The simple fact that you decide to devote a certain period of every day to prayer, making a disciplined effort to concentrate on others and expressing unselfish desires, already creates a definite change in the organism of your subtle bodies, as well as eventually in your physical body. Most people are not capable of cultivating compassionate and good thoughts throughout their daily lives. While they can succeed in prayer, outside of it they fall back into the bad habits of their erring souls. Love, well-meaning and unselfish goodwill, can be expressed in prayer, but only some of the time when you are not praying. When something goes wrong, most people are unable to feel what they can sincerely feel when they pray. So the importance of prayer lies not only in training your ability to concentrate, to discipline yourself; you also learn to cultivate thoughts you are unable to sincerely feel when you do not pray. In prayer you may sincerely wish well those who have hurt you. Outside of prayer, you cannot do so as yet. At the beginning, for some people this is difficult even in prayer, but eventually they will succeed if they try again and again. Prayer has a wonderfully cleansing effect on your soul. Of course, the ultimate aim is that your whole life will become a prayer. But that is a long way off. None of my friends are far enough advanced yet seriously to live a prayer. When you are that far, you will not have to sit down at a certain time each day and pray, because you will then emanate prayer by every breath you take, by every thought passing through your mind; even your unconscious feelings will be prayer. Oh, I know there are many people, particularly nowadays, who force themselves to think positive thoughts. But that is not what I mean. Prayer must come from the heart, from the innermost recesses of the mind. If emotional currents do not follow suit in harmony with the positive thoughts, then there is a self-deception that may bring greater repercussions than if you stated clearly and simply where you stand in your own mind. To find the truth about yourself—the chasm that exists between your thoughts and your feelings—prayer is necessary. It is vital that you learn to focus your attention on yourself—not selfishly, but constructively. Your attention should be focused as well on your problems from a spiritual point of view, if you want to advance on your path. In prayer you will automatically tend to view yourself, your faults, your problems, and your experiences in a different light than you would have done if you were still affected by the often unspiritual influences of your usual surroundings. Developing a concise understanding of yourself and your problems is another requirement. It introduces an order into your soul that cannot be maintained without your unceasing efforts. You will then learn to realize, deeply, that your outer problems are nothing else than the manifestation of your inner shortcomings. It is not easy to reach this understanding. Only by clear-cut and concise expression—at least in thought forms and clear statements—will you reach this point. How many of you still separate your problems from your shortcomings, even if you do know in theory and in principle that a connection exists? How much work does it take to make the connection between the two? That part of the work should be done also in prayer. You can, if you prefer, call it meditation. It is the same. Through meditation you take the trouble to clarify and to present your problems concisely to God and to yourself. You must know God wants you to find out the truth within yourself. No one can find answers and develop without daily prayer. Ordinarily your thoughts run wild. You concentrate, perhaps to excess, on a minor detail, overemphasizing the effect instead of going to the cause. People often do not bring into focus what is of real importance unless they are in prayer. I do not wish to imply that everyone who prays goes to the heart of the matter. There are many who pray daily, using ready-made prayers, or perhaps self-made ones, but without doing what is most essential for their purification. However, any person who wants to be on the path will often find the strength and the desire to do so when praying, in direct awareness of the duty to do God’s will. Otherwise, one is tempted to follow an old line of thinking and reacting, shirking the real issues. Another important element of prayer is that anyone who approaches God in prayer will automatically have a more humble attitude. Even people who constantly blame others and the world, or fate, or God for their miseries will, at least during the time of prayer, change their way of thinking and become more humble. Gradually but surely, this new attitude will become theirs at all times. Others, who feel strongly—although they may not be conscious of it—that the whole world revolves around their ego, that they are the most important beings, will learn to feel differently by cultivating thoughts in prayer that gradually will affect their emotional currents and their entire outlook on life. People who feel their ego to be the center of the world tend to judge everything from a subjective point of view. Such people—many of whom also display goodwill toward self-development—have an inner image which makes them feel that they are the highest, most important creatures in the universe. Even their idea of God is cut to order to suit their personal, unpurified needs. There are many who are too proud to ask for a favor. When they pray they have to learn that. A special kind of humility is summoned up when one asks and accepts a favor from someone more powerful. How many feel ashamed to do so and are even proud to feel ashamed? Isn’t that a sign of pride? 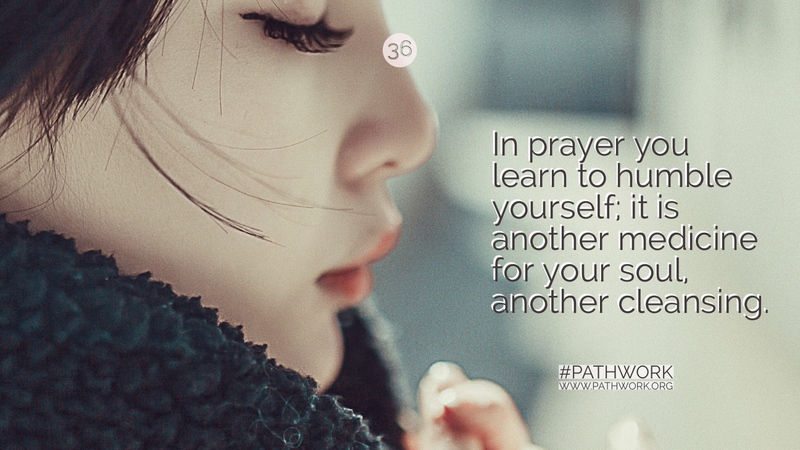 In prayer you learn to humble yourself; it is another medicine for your soul, another cleansing. So, my friends, do not tell me, “I love God and I try to be a good person; I do not need to pray unless I feel particularly inspired.” This is utterly wrong. The further you are developed, the more is expected of you, and the greater is your duty to overcome what is most difficult for you. God will not make it easier for you to arrive at this daily discipline by sending you the necessary inspiration and “mood.” You have to learn how to overcome the difficulties of making this daily cleansing process second nature. The more difficult it is to summon the discipline for the daily prayer, the more you need it! It is a fact that whatever you neglect on your path, whatever way you deviate from your life plan, will create new repercussions in your life. The person who has already made prayer a daily discipline must be careful of an opposite extreme—the extreme of routine. Routine is always apt to become the pitfall for many good things. One of the difficulties in experiencing the perfection of divine harmony is to find the happy medium in everything and to resist extremes which are always temptations. You have to find a proper balance. By routine I mean that you go on praying for the same things and the act itself gives you a certain satisfaction, as of a duty done. As long as the daily discipline is difficult to muster, you have to fight to attain it. Once it does become second nature, do not cease praying, but be wakeful that your prayer remains alive. Be mindful and wary that you do not just say words that have also become a habit, and that, though they are good words as such, you do not feel as strongly about them as you did when they were new. Furthermore, pray according to your daily needs. You do not remain at the same point, particularly when you are on the path. Your phases change as you move around your personal vicious circle. And life will bring challenges and experiences for you—big or small—according to your present developmental needs. Thus different problems will come to the surface at different times. Be watchful and adjust your prayer accordingly, to keep it forever new and alive. The various points of your vicious circle will come up in turn, as time goes by. Each point may be at the surface for a certain period—for a few weeks or even months at a time. You cannot concentrate with equal strength on all the points in your circle, but there will come the phase where you can centralize a few major issues in the vicious circle. Concentration on the overall picture can be practiced occasionally when you make a major recognition. To adjust your prayer to the phases of your development, you need to be watchful and recognize how the daily events in your life and your reactions to them relate to your inner vicious circle. You can thus resist the temptation of making your prayer into a routine. It will then remain alive, ever changing according to your changing path. Gradually, you will be able to concentrate better on what is needed each day and you will not disperse yourself. In order not to neglect the many things for which you pray that have nothing to do with yourself directly, you may keep certain highlights that you want to remember, but here again be careful that you keep your feelings alive. Listen to the strength of your feelings. Take your daily needs—not material needs—into your prayer and consider all that happens from the viewpoint of spiritual development, asking God for help and understanding. You may have to struggle for this understanding. So it is necessary that you then penetrate your unconscious with these new insights by forming the thought form from various angles. Ask God each day what you have to learn. Ask for His help. This will gradually impress your unconscious mind so that a good imprint can form within yourself. The process amounts to instructing your unconscious. It keeps clearly in front of your mind’s eye what your immediate goal is—the goal you can see now. It will also give you a better knowledge of how much you continue to deviate from the goal when you observe yourself in your daily review. If you who work in such a way on the path gradually dissolve the separating wall around the soul, then divine strength and help cannot fail to flow into you. But you have to do it first, my dear ones. QUESTION: Isn’t prayer also a confirmation of faith in God? ANSWER: Of course it is. That is part of what I have been saying, although I did not express it the same way. QUESTION: Could you give us three or four highlights of what should be part of every prayer every day? ANSWER: The spreading of truth among humankind. Praying for unhappy souls and human beings generally. Praying for loved ones—which is easy. Your prayers should also be for those whom you do not like. The more you dislike them, the more you should pray for them. Then try to observe your feelings when you wish them happiness. Do not deceive yourself. Say to yourself, “A part of me wants this; another part of me is still struggling against good wishes for certain people.” In this way, you will not be living a lie. Try it and ask God to help you to feel wholeheartedly within yourself love for everyone, at least while you pray. Everyone should pray for peace, for love, brotherhood, justice, the spreading of divine law. But you can only be a great contributor to peace and brotherhood if you cultivate these qualities within yourself. As long as hatred, resentment, and intolerance exist in you, you contribute to the opposite of all that you pray for. Your realization that you are a part of the Universe and can further or hinder divine truth, peace, and love, will make you feel more responsible, and your prayer for all these highest values will not be divorced quite so much anymore from your own development and your sense of participation with every other creature in existence. The self-will, pride, and fear inherent in every human being will give way to humility, love, and the willingness to have God’s will done in all respects. But do not only pray for this in general; try to observe in yourself exactly where you react, think, and feel differently from what is pleasing to God. Pray that you may find out specifically what your fears are. And once this prayer has been answered, pray that you can overcome your fears by being able to accept what you fear, provided it is God’s will for you and it is good for your development and spiritual growth. Pray for the ability to embrace pain as well as happiness. Pray that you do not love your ego so much that you shirk the healing agent of occasional pain. Pray for the courage to take pain in the right manner. Then, in the ultimate sense, pain must be one with happiness. When you reach a certain point on your road to God, you will not know the difference between pain and pleasure. Pain will be happiness and happiness will be pain in a blissful sense. All is one in the end. I realize, my friends, that these are merely words just now—perhaps even dangerous words for some of you. You should not try to force the state of being I am explaining here. You cannot force it. Anything can be perverted, especially when it is forced. So beware of forcibly assuming the states which I am describing here. Simply continue on your path, step by step, and every day you will accomplish something. And that is good. Do not hurry. Results develop organically out of immediate efforts and needs. If you pray for all this and, in addition, introduce your changing personal problems into the fabric of your prayer, you will reap the fruits. QUESTION: There are some theories that say that in order to achieve the discipline of daily prayer, one should set aside the same time every day. I think that this leads rather to the routine against which you warned us. Which is right? ANSWER: You cannot generalize. For some people it is right to do it one way, for others, another way. If a person continues to have difficulty in mastering a discipline, then the same time and same place every day may be helpful. There are also cases when discipline can be just as well or better developed if one does not bind oneself pedantically. This depends on the person’s way of life, on his or her character; on many circumstances. One cannot make a rule. QUESTION: But to start the day with prayer gives a spiritual direction to the day; and, again, the evening should be good for peace, is this not so? ANSWER: Oh yes, I should say that every person can devote at least two or three minutes to prayer when they get up and when they go to bed. But that does not necessarily have to be the time. Some people may find another time of the day better, but they should still rise and retire in God and with God. This does not take more than a few minutes and should be done in addition to the long prayer that will take at least half an hour. The important thing for the longer prayer is that you know you have sufficient time and that no one is going to disturb you, so that you can be wholly relaxed. When that time should be is different for each person. There is an individual rhythm for everyone. Be blessed, my dear ones. Be in peace, be in God.